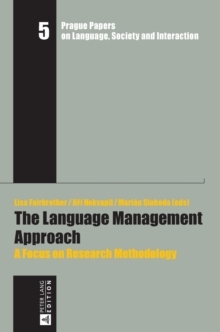 The chapters in this volume reflect the variety of methods that researchers have recently applied in their investigations of "behavior toward language", or language management. The innovative methods introduced in the volume will appeal to researchers interested in different types of introspective interview methodology and discourse analysis, and to those looking for ways of linking language policy to everyday social interactions. The broad spectrum of themes taken up by the authors include the practices of language cultivation agencies, the use of first and second languages in educational contexts, attitudes toward language varieties, the use of language in immigrant communities, and the processes underlying literary criticism.